Rickie Fowler showed up at Merion on Wednesday donning a white shirt and pants but splattered his outfit with some very loud – and limited edition – accessories (hat, shoes and belt). The colorful, paint-splattered products were created at a 'Golf Art' event Fowler took part in with Puma Golf. By chipping paint-covered balls onto blank canvases and placing white hats between himself and the canvas, Fowler created one-of-a-kind artwork and hats. 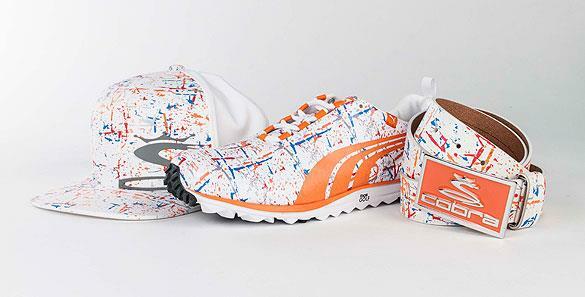 This year, the paint-splatter graphic was used on the shafts and headcovers of Cobra's popular AMP CELL product line and is now available on the limited edition paint splatter cap, belt and Faas Lite footwear. For more information or to purchase the products (available for a limited time only), visit www.cobragolf.com and www.shop.puma.com.